Our srI vaishNava sath sampradhAyam is based on ubhaya vEdhAntham. ubhaya means "both" (two aspects) and vEdhAntham means the end (top-most) part of vEdham. There is samskritha vEdham (rg, yajur, sAma, atharvaNa) and vEdhAntham (upanishadhs) and there is dhrAvida (thamizh) vEdham (dhivya prabhandham) and vEdhAntham (vyAkyAnams). They are considered to be the two eyes - both have equal importance. Yet, since AzhwArs, who are the authors of dhivya prabhandham and who were divinely blessed with blemishless knowledge by emperumAn, have revealed the essence of samskritha vEdham in the 4000 dhivya prabhandham with total focus on the upliftment of all, we have greater affinity towards them. adhyayanam means to study, to learn, to repeat/recite, etc. vEdham is studied under AchAryas by hearing from them and repeating the same. vEdha manthrams are also regularly recited as part of daily anushtAnams. anadhyayanam means to refrain from learning/reciting. There are certain times of the year when vEdham is not recited. This time is leveraged to learn other parts of sAsthram such as smrithi, ithihAsams, purANams, etc. Even through out the year, days such as amAvAsyai, paurNami, prathamai, etc., are not conducive for learning vEdham. As dhrAvida vEdham (4000 dhivya prabhandham) is also considered equivalent to samskritha vEdham, there is a tradition of not learning/reciting dhivya prabhandham during certain period of time. Let us now understand the history of dhivya prabhandham's anadhyayana kAlam tradition. anadhyayana kAlam coincides with and encapsulates adhyayana uthsavam. 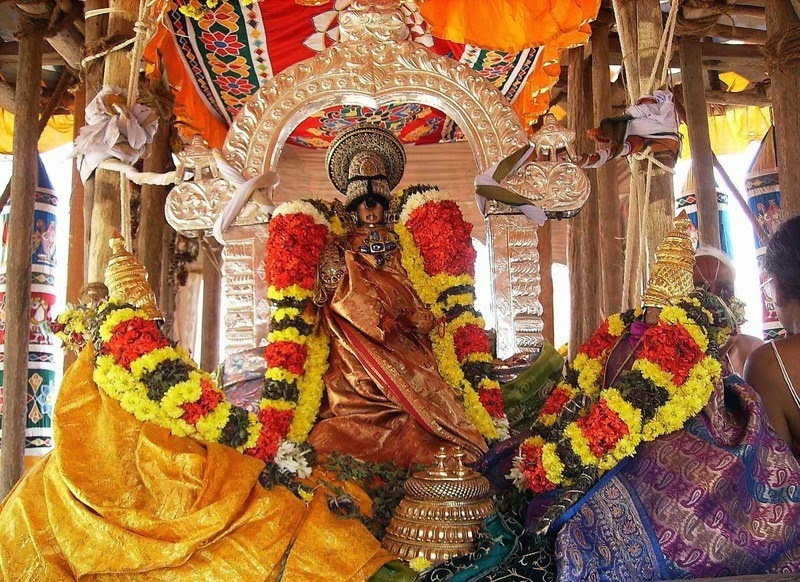 adhyayana uthsavam is celebrated to glorify nammAzhwAr's ascending to paramapadham. The history of anadhyayana kAlam and adhyayana uthsavam are closely related in srIvaishNava tradition. The history is revealed elaborately in a grantham named "kaliyan aruL pAdu" (http://srivaishnava-literature.blogspot.in/p/kaliyan-arul-padu.html) which is composed by periyavAchAn piLLai (published by puthUr krishNaswamy iyenagAr as part "periyavAchAn piLLai srI sUkthimAlA malar - 1"). Let us now see a quick summary of the events highlighted in this beautiful grantham. srIman nArAyaNan, out of his causeless mercy for the upliftment of all, descends into this samsAram and assumes various archAvathAra (deity) forms at kOil (srIrangam), thirumalai (thiruvEnkadam), perumAL kOil (kAnchIpuram), etc., which are easy to approach and serve for everyone. thirumangai AzhwAr (who is the last among AzhwArs), after being reformed by bhagavAn out of his causeless mercy, worshipped many archAvathAra emperumAns and finally arrive at srIrangam and lives there performing many wonderful kainkaryams. He was famously identified by himself as "irunthamizh nUl pulavan mangaiyALan" (irunthamizh nUl - thiruvAimozhi, pulavan - poet; one who is expert in thiruvAimozhi, mangaiyALan - thirumangai AzhwAr) and showed great attachment to AzhwAr's pAsurams and was constantly engaged in reciting them. Once on a thirukkArthigai (kArthigai dhIpam day generally coinciding with kArthigai month, kArthigai nakshathram and paurNami thithi), after namperumAL and his consorts undergo thirumanjanam (divine bathing) and are seated in a great assembly of devotees, thirumangai AzhwAr composes thirunedunthANdagam and sings it infront of emperumAn with divine music. He also sings some pAsurams from thiruvAimozhi with divine music. namperumAL becomes ecstatic hearing such divine composition and singing, and asks thirumangai AzhwAr if he has any desire to be fulfilled. emperumAn happily obliges and grants both the desires to be fulfilled. At once, emperumAn orders to the assembly that since kaliyan has been singing divine music for a while, his throat will be disturbed, so he should be given the remnants of the oil that was applied on him (emperumAn) during thirukkArthigai dhIpa uthsavam. After that a message is sent to nammAzhwAr who is at AzhwAr thirunagari (in archA/deity form). nammAzhwAr receives the message and at once leaves AzhwAr thirunagari and reaches srIrangam soon. 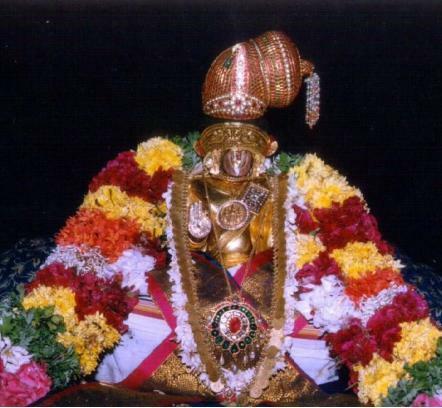 thirumangai AzhwAr arranges thiruvAimozhi to be recited for 10 days starting on vaikuNta EkAdhasi. In the morning vEdha pArAyaNam is done and in the night thiruvAimozhi is recited. 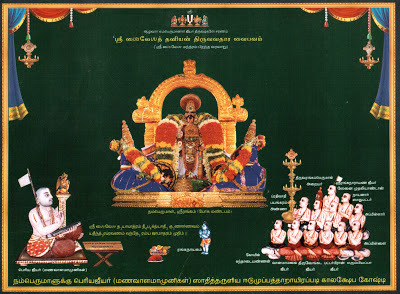 On the final day, nammAzhwAr thiruvadi thozhal (nammAzhwAr touching the lotus feet of namperumAL with his head) is enacted with great enthusiasm. After the celebrations, nammAzhwAr returns to AzhwAr thirunagari. This continues to happen every year. After some time, due to the nature of kaliyugam, things deteriorate, dhivya prabhandhams becomes lost and AzhwAr also does not visit srIrangam. nAthamunigaL takes birth and eventually by bhagavAn's grace, he hears about AzhwArs and dhivya prabhandham. He visits AzhwAr thirunagari, learns madhurakavi AzhwAr's kaNNinuN chiRu thAmbu (which glorifies nammAzhwAr) and by the grace of nammAzhwAr he learns all 4000 dhivya prabhandham and their meanings. He then teaches the same through his sishyas and arrives at srIrangam and re-establishes adhyayana uthsavam in full-fledge. Having understood the glories of all AzhwArs and 4000 dhivya prabhandhams through nammAzhwAr, nAthamunigaL arranges nammAzhwAr's visit once again. Since emperumAn declared vEdha sAmyam for thiruvAimozhi, similar to vEdham's anadhyayana kAlam, he establishes the same for thiruvAimozhi and other dhivya prabhandhams as well. For dhivya prabhandhams, on thirukkArthigai dhIpam, anadhyayana kAlam begins and it ends just before the beginning of adhyayana uthsavam (at temples). adhyayana (reciting) kAlam begins during the first day of adhyayana uthsavam and ends on thirukkArthigai dhIpam. He also (re)establishes that a message is sent to AzhwAr with the orders of bhagavAn to arrive at srIrangam. This message also instructs srIvaishNavas to refrain from reciting dhivya prabhandham while they are constantly engaged on meditating the pAsurams and their meanings in their heart (only reciting out loud is disallowed - meditating/remebering is always required). He also arranges that the remnants of oil that was anointed on emperumAn on thirukkArthigai dhIpam day, was applied on the throats of nammAzhwAr (the leader of all AzhwArs), kaliyan and other AzhwArs and the remnants of that is given to srIvaishNavas. 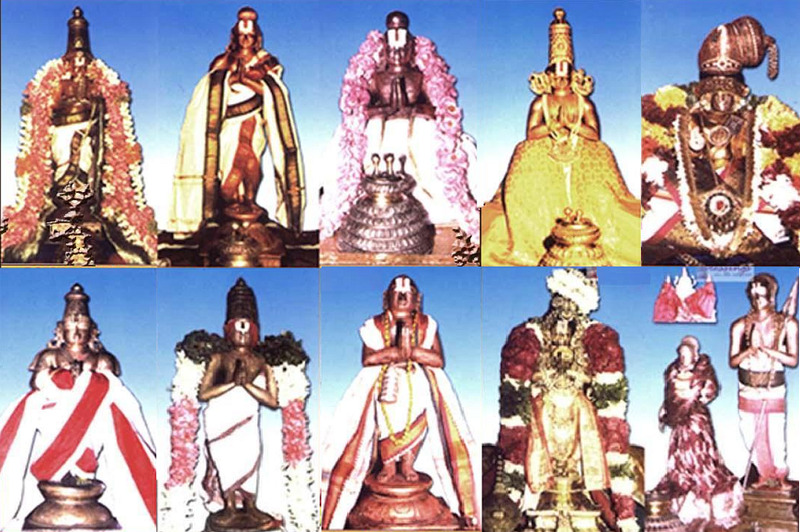 nammAzhwAr's thiruvirutham, thiruvAsiriyam, periya thiruvanthAdhi and thiruvAimozhi are equivalent to 4 vEdhams and the dhivya prabhandhams of other AzhwArs are like vEdha angams (parts - shIkshA, kalpam, vyAkaraNam, niruktham, chandhas, jyOthisham) and upAngams (sub-parts). These prabhandhams also explain the divine meanings of thirumanthram, dhvayam and charama slOkam. 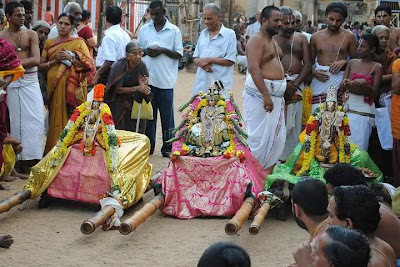 on the first 10 days of adhyayana uthsavam (starting on amAvAsyai before vaikuNta EkAdhasi), mudhalAyiram (thiruppallANdu, periyAzhwAr thirumozhi, nAchiyAr thirumozhi, perumAL thirumozhi, thiruchchantha viruththam, thirumAlai, thiruppaLLiyezhuchi, amanAdhipirAn, kaNNinuN chiRu thAmbu), periya thirumozhi, thirukkuRunthANdagam, thirunedunthANdagam) are recited. On vaikuNta EkAdhasi day, thiruvAimozhi thodakkam (beginning) is done. In the morning vEdha pArAyaNam is performed and in the evening thiruvAimozhi is recited for 10 days (1 centum per day). On the last day nammAzhwAr thiruvadi thozhal happens with a grand sARRumuRai. On the 21st day, iyaRpA (mudhal thiruvanthAdhi, iraNdAm thiruvanthAdhi, mUnRAm thiruvanthAdhi, nAnmugan thiruvanthAdhi, thiruviruththam, thiruvAsiriyam, periya thiruvanthAdhi, thiruvezhukkURRirukkai, siRiya thirumadal, periya thirumadal) are recited. (Note: rAmAnusa nURRanthAdhi is added subsequently by the orders of namperumAL during the times of emperumAnAr and is usually recited on the puRappAdu on the night of the 21st day after iyaRpA sARRumuRai/completion). nAthamunigaL also establishes that just like a brAhmaNa must learn vEdham, srIvaishNavas who are prapannas, must learn dhivya prabhandham. Also during mArgazhi month, in the early mornings thoNdaradippodi AzhwAr's thiruppaLLiyezhuchi and ANdAL's thiruppAvai are recited (even though its anadhyayana kAlam - since these two prabhandhams are focussed at waking up bhagavAn and bhAgavathas respectively, they are exempted during mArgazhi month). This routine goes on during uyyakkoNdAr, maNakkAl nambi, ALavandhAr, periya nambi and emperumAnAr's times. Once during emperumAnAr's times, due to some reason (safety reasons, etc), nammAzhwAr could not arrive at srIrangam. emperumAnAr orders nammAzhwAr's archA vigraham to be established immediately along with other AzhwArs and orders the same to be done in all dhivya dhEsams. 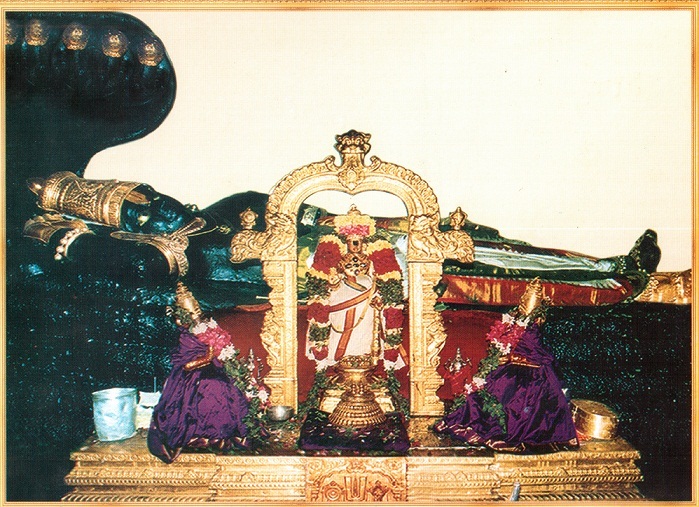 In thirumalai, since the hill is considered as bhagavAn's divine body, AzhwArs deity forms are established at the foot hills of the thiruvEnkatam. He also orders that adhyayana uthsavam is celebrated in a grand manner in every dhivya dhEsam. 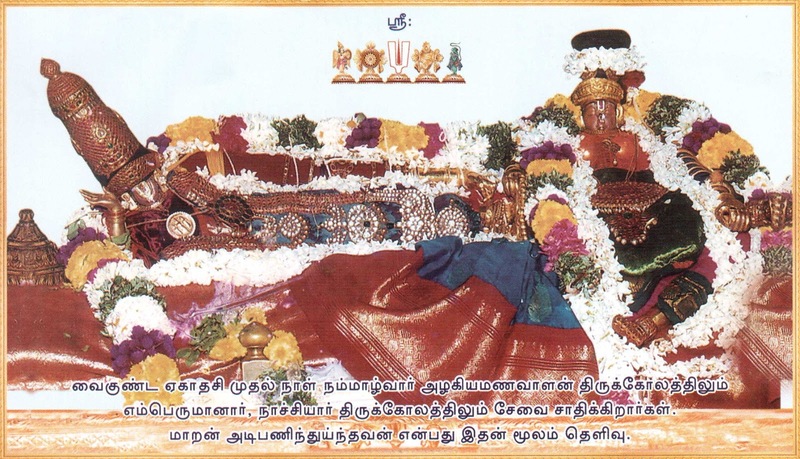 thirukkurugai pirAn piLLAn compiles a vyAkyAnam for thiruvAimozhi (with the permission of emperumAnAr) and presents the same to emperumAnAr. emperumAnAr happily orders that every one learns the same along with srIbhAshyam. emperumAnAr lived in srIrangam for a long time with great assembly of srIvaishNavas. He taught them the most important and essential principles and was constantly engaged in performing mangaLAsAsanam to periya perumAL. After emperumAnAr ascending to paramapadham, bhattar (who is the divine son of AzhwAn and adopted son of srI ranganAthan and srI ranganAchiyAr), piLLAn (who is abhimAna puthrar of emperumAnAr himself), aruLALa perumAL emperumAnAr, embAr, kanthAdai ANdAn, etc., established the archA vigraham of emperumAnAr at srIrangam based on the orders of emperumAn himself for the upliftment of everyone. The same was done in all the other dhivya dhEsams as well. Just like nAthamunigaL added kaNNinuN chiRu thAmbu into 4000 dhivya prabhandham due to its glorious meanings, emperumAn orders rAmAnusa nURRanthAdhi to be added into 4000 dhivya prabhandham. Just like gAyathri japam is compulsory for a brAhmaNa every day, for a prapanna, rAmAnusa nURRanthAdhi which is hailed as prapanna gAyathri is essential for every one. All the subsequent AchAryas spent their time spreading the glorious principles that were highlighted by srI rAmAnuja for the upliftment of everyone. Thus ends kaliyan aruL pAdu prabhandham. Subsequently, parAsara bhattar goes on a divine sojourn to thirunArAyaNapuram to debate with vEdhAnthi, wins him over in the debate and accepts him as his sishya. vEdhAnthi accepts bhattar as his AchArya and takes up sannyAsam. He becomes to be famously called as nanjIyar. bhattar on his return after winning over vEdhAnthi in the debate, arrives at srIrangam on the day before the beginning of adhyayana uthsavam. periya perumAL enquires bhattar about the debate and bhattar explains that he won over vEdhAnthi using the principles explained by thirumangai AzhwAr in thirunedunthANdagam dhivya prabhandham. periya perumAL becomes greatly pleased and orders bhattar to be glorified greatly and also establishes that adhyayana uthsavam starts with thirunedunthANdagam recital in srIrangam. Thus ends the brief history of adhyayana uthsavam in our sath sampradhAyam. The general celebrations involve the following routine for 21 days in most dhivya dhEsams. emperumAn, nAchiyArs, AzhwArs and AchAryas will be seated in a big assembly throughout the 21 days. While emperumAn and nAchiyArs will be seated right in the middle of the assembly, AzhwArs and AchAryas will be seated in two rows (in the two sides) of the maNdapam facing each other. In a lot of dhivya dhEsams, nammAzhwAr will head the AzhwAr gOshti seated along with thirumangai AzhwAr and emperumAnAr (due to their great contribution for our srIvaishNava sath sampradhAyam), followed by other AzhwArs and AchAryas. 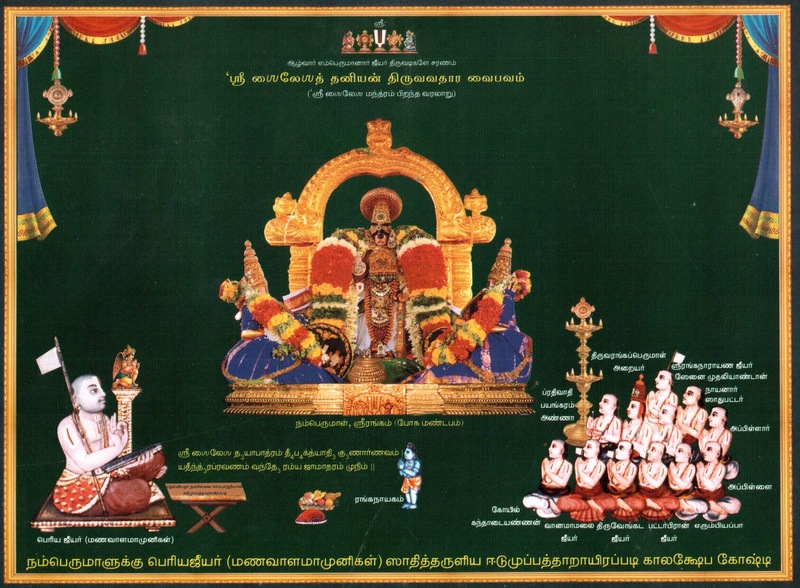 In dhivya dhEsams such as vAnamAmalai, thirukkuRungudi, etc., where there is no separate archA vigraham for nammAzhwAr, kaliyan (thirumangai AzhwAr) and emperumAnAr will preside over the celebrations. In srIperumbUthUr, ANdAL nAchiyAr joins AzhwAr gOshti (instead of being seated along with emperumAn and nAchiyArs) since emperumAnAr has greater significance here and ANdAL nAchiyAr accepts emperumAnAr as her elder brother (so she joins AzhwAr/emperumAnAr gOshti). Starting with vaikuNta EkAdhasi, during the evening, paramapadha vAsal (gate/door) will be opened. nammAzhwAr (and other AzhwArs/AchAryas depending on the dhivya dhEsam's practice) will wait outside facing the gate and will perform mangaLAsAsanam to emperumAn and will proceed for a puRappAdu (procession). 10 days of mudhalAyiram and periya thirumozhi recital (during afternoon) - pagal paththu (first 10 days - thirumozhi thirunAL). In dhivya dhEsams where there is a procession, upadhEsa rathina mAlai will be recited during the procession. 20th day ending with AzhwAr thiruvadi thozhal and thiruvAimozhi sARRumuRai. During thiruvadi thozhal, nammAzhwAr is carried in the hands of the archakas upto emperumAn and his head is placed at the lotus feet of emperumAn. Subsequently he will be covered with thuzhasi leaves. night - puRappAdu (procession) with rAmAnusa nURRanthAdhi gOshti and iyal sARRu. There are certain special aspects in certain dhivya dhEsams in relation to adhyayana uthsavam. Let us see them now. 22 days of celebrations - additional day in the beginning, i.e., first day thirunedunthANdagam recital, followed by 21 days of uthsavam. araiyar sEvai with actions of pAsurams. Whatever is recited by araiyar on a particular day, the same thing will be recited by adhyAbhakas in gOshti the next day. 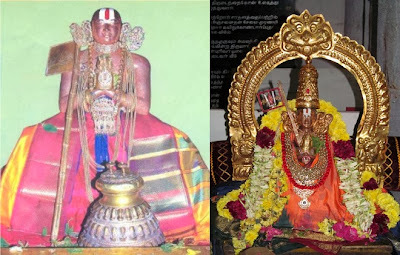 On the 10th day of pagal paththu (dhasami - day before vaikuNta EkAdhasi), special dharshan of nammAzhwAr and emperumAnAr - nammAzhwAr as srI ranganAthan in sayana (lying-resting) thirukkOlam (posture) and emperumAnAr as srI ranganAchiyAr at the lotus feet. Everywhere it is thiruvadi thozhal (nammAzhwAr reaching out to emperumAn's lotus feet) on the last day of rAppaththu (20th day). But here, it is thirumudi thozhal - emperumAn is carried by archakas in their hands and he goes and places his lotus feet on nammAzhwAr's head. Its a wonderful sight to watch and is clear establishment of paragatha svIkAram principle (that it is emperumAn who willingly and graciously accepts jIvAthmA into his fold). 22 days of celebrations - additional day in the end named "vIdu vidai thirumanjanam" (special bathing ceremony). 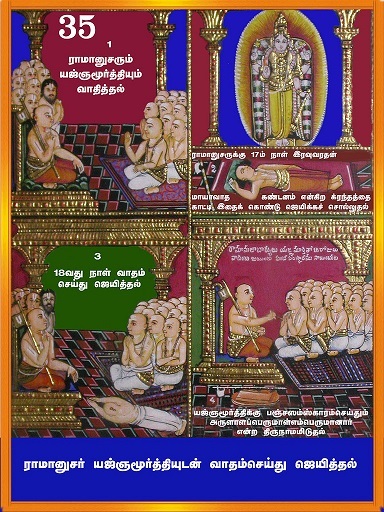 nammAzhwAr declares in thiruvAimozhi that dhEvapirAn emperumAn is his father and mother. He has great attachment towards the emperumAn in this dhivya dhEsam. It is said that, in the olden days, when AzhwAr returned from srIrangam, he would arrive at thulaivillimangalam and stay there with emperumAn here until mAsi visAgam and then leave to AzhwAr thirunagari. In memory of that, nammAzhwAr arrives on mAsi visAgam to this dhivyadhEsam (at the end of 13 days festival in mAsi month celebrated at AzhwAr thirunagari). He stays with emperumAn for the whole day, enjoys thirumanjanam, gOshti, etc and leaves at the end of the day. Generally thirukkArthigai dhIpam and kaliyan's thirunakshathram (kArthigai/kArthigai) will coincide. But at times, if there are two kArthigai nakshathrams in the month, the second one will be celebrated as thirumangai AzhwAr thirunakshathram. Even if anadhyayana kAlam begins in all dhivya dhEsams during thirukkArthigai dhIpam, here it starts only after thirumangai AzhwAr thirunakshathram completion to facilitate 4000 dhivya prabhandham recital and grand celebrations for thiumangai AzhwAr thiruvavathAra uthsavam. 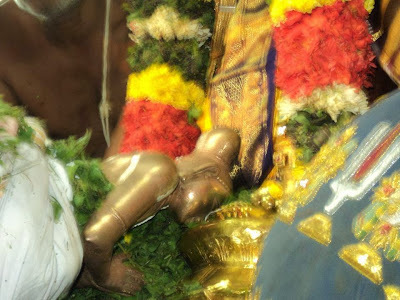 In addition to the regular 21 day celebrations, kaliyan's thiruvadi thozhal (kaliyan worshipping lotus feet of emperumAn) is also celebrated on the last day pagal paththu. guru pushyam is celebrated for 3 days ending on thai (makara/thaisya) month pUsam (pushya) nakshathram. This is the day when emperumAnAr archA vigraham was established in srIperumbUthUr. This is of greater significance here. If adhyayana uthsavam coincides with guru pushyam, adhyayana uthsavam will be celebrated earlier. The day after iyaRpA completion, usually in temples, thiruppallANdu recital will begin and normal routine of dhivya prabhandham recital will resume. There are many other wonderful specialities that are specific to many dhivya dhEsams. At homes, the recital of dhivya prabhandham during anadhyayana kAlam is viewed differently at different dhivya dhEsams. In a lot of dhivya dhEsams, the home recital routine will closely follow the temple practice. For example, dhivya prabhandham is not recited from the day after thirukkArthigai dhIpam (or whenever anadhyayana kAlam begins at the temple). It is resumed on the day of thiruppallANdu thodakkam (beginning) at the temple (which is the day after iyaRpA sARRumuRai generally). Some have the perspective that, dhiyva prabhandham recital is resumed from thai hastham (kUrathAzhwAn thirunakshathram) at homes. This is based on the principle that, in the olden days, srIvaishNavas would flock to srIrangam to attend the adhyayana uthsavam to be with namperumAL and nammAzhwAr. Once the uthsavam is over, it would take several days to return back to their home towns. To commemorate this, at homes, people would begin dhivya prabhandham recital on thai hastham. Its best to enquire from the elders about the normal practice by their elders in their dhivya dhEsams and follow the same principle. What to learn and recite during anadhyayana kAlam? Generally in temples, during anadhyayana kAlam, upadhEsa rathina mAlai will be recited in place of thiruppAvai and thiruvAimozhi nURRanthAdhi will be recited in place of kOil thiruvAimozhi/rAmAnusa nURRanthAdhi. In mArgazhi month, thiruppaLLiyezhuchi/thiruppAvai recitation resumes. In the temples, during adhyayana uthsavam, all 4000 pAsurams will be recited once. At homes, during thiruvArAdhanam, pAsurams from 4000 dhivya prabhandham are not recited during anadhyayana kAlam (same principle for mArgazhi month as in the temples too - thiruppAvai and thiruppaLLiyezhuchi are recited). During opening the kOil AzhwAr, we recite jithanthE sthOthram (first 2 slOkams), "kausalyA suprajA rAma" slOkam, "kUrmAdhIn" slOkam (these are recited normally as well) and directly open the door. again, there is no limit to remembering/meditating on AzhwAr pAsurams in heart/mind while opening the door. Similarly, during thirumanjanam, after reciting sUkthams, we recite "veNNai aLaintha kuNungum" padhigam and a few extra pAsurams - during anadhyayana kAlam, we just stop with sUkthams. During manthra pushpam, we recite "chenRAl kudaiyAm" pAsuram normally. During anadhyayanam, we recite "emperumAnAr dharisanam enRE" pAsuram in place of that. For sARRumuRai, we recite upadhEsa rathina mAlai and thiruvAimozhi nURRanthAdhi pAsurams instead of "chiRRam chiRukAlE", "vangak kadal" and "pallANdu pallANdu" pAsuram followed by "sarva dhEsa dhasA kAlE..." routine and vAzhi thirunAmams. This is a good time to learn pUrvAchArya sthOthra granthams in samskritham (there are quite a few) and thamizh prabhandhams such as gyAna sAram, pramEya sAram, saptha kAthai, upadhEsa rathina mAlai, thiruvAimozhi nURRanthAdhi, etc. Also, we can learn and recite the thanians and vAzhi thirunAmams of our AchAryas during this time. Also, one can engage in learning rahaysa granthams during this time and memorize the same. the opportunity to learn the most wonderful sthOthra granthams of our pUrvAchAryas which are filled with the essence of sAsthram in simple and divine samskritham language. And of course, to learn and cherish the thamizh prabhandhams of pUrvAchAryas as well. Thus we have observed some of the aspects of anadhyayana kAlam and adhyayana uthsavam in this article. The glories of nammAzhwAr and thiruvAimozhi reached great heights after the advent of maNavALa mAmunigaL who spent his entire life to teach the divine principles of dhivya prabhandham for the upliftment of the entire world. Not only that, he practically demonstrated the great qualities of srIvaishNavam that were highlighted by AzhwArs and AchAryas in their glorious literature. This is why namperumAL himself acknowledged the unique/glorious nature of mAmunigaL and ordered him to give a series of lectures on bhagavath vishayam (based on nampiLLai's eedu vyAkyAnam and other vyAkyAnams of thiruvAimozhi) for a whole year. On completion of the lecture series on a fine Ani thirumUlam day, srI ranganAthan appears as a small boy and recites the most magnificient "srI sailEsa dhayApAthram" thanian and accepts mAmunigaL as his AchAryan. Let us prepare ourselves for these great celebrations that are about to begin in the near future. aruLALa perumAL emperumAnAr is a dear sishya of emperumAnAr himself.emperumAnAr personally taught him dhivya prabhanadham and all the essential principles of our glorious sampradhAyam. He was also given the responsibility by emperumAnAr of taking care of emperumAnAr's personal thiruvArAdhana deities. Let us see his charithram briefly (Full details available in http://guruparamparai.wordpress.com/2012/11/28/arulala-perumal-emperumanar/). He was originally named yagya mUrthy and was a great scholar in mAyAvAdham. He was an EkadhaNda sannyAsi. He once visited srIrangam and challenged srI rAmAnuja for a debate. It was agreed upon that the loser of the debate will become the sishya of the winner. srI rAmAnuja also declared that he will give up doing any literary work if he lost the debate. The debate begins and goes on for 18 days without convincing victory for either one. On the 17th day, yagya mUrthy was getting an upper hand towards the end. In the night, emperumAnAr prays to pEraruLALan (his personal deity) and requests him to ensure that the sidhAntham which was propagated by nAthamunigaL and yAmunAchAryar is up-held without any blemish. He does not eat in the night due to anxiety and meditates on emperumAn. emperumAn appears in his dream and suggests that he uses the divine works of yAmunAchAryar and establish the sidhAntham. emperumAnAr wakes up and feels much confident, performs his daily anushtAnams and reach the place where the debate is happening. yagya mUrthy sees the divine thEjas in emperumAnAr due to the divine mercy of emperumAn and at once realises his inabilities. He falls at the lotus feet of emperumAnAr and accepts his defeat at once. When emperumAnAr asks yagya mUrthy why he gave up the debate, yagya mUrthy replise "When periya perumAL himself appears directly to you, I can understand that periya perumAL and you are non-different from each other (a true representative of him). I have no qualification to speak in front of you any more". emperumAnAr is very pleased with yagya mUrthy's attitude and still goes on to establish the sidhAntham and clarify any doubts in the minds of yagya mUrthy. emperumAnAr then performs pancha samskAram to yagya mUrthy and as part of that, he gives the name "aruLALa perumAL emperumAnAr" to yagya mUrthy. The name is a combination of "pEraruLALan" (varardharAjan - emperumAnAr 's personal deity) and his own name. aruLALa perumAL emperumAnAr also accepts srIvaishNava sanyAsAsramam from emperumAnAr himself after breaking his EkadhaNdam, accepts a thridhaNdam, shikai, yagyOpavItham, etc and stays in his own mutt closer to emperumAnAr's mutt. He starts learning the srIvaisNava sampradhAyam principles from emperumAnAr himself. Once when two travelling srivaishnavas ask some one in the streets of srIrangam “where is emperumAnAr‘s mutt?”. At that time, a local person replies “which emperumAnAr?”. 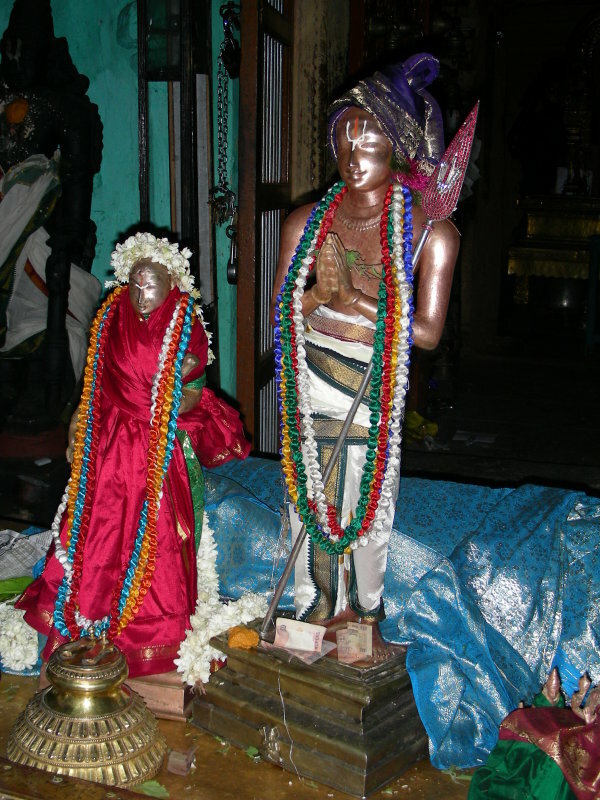 The srivaishnavas ask “Are there two emperumAnAr’s in our sampradhAyam?” and the local person replies “Yes, there is emperumAnAr and there is aruLALa perumAL emperumAnAr”. The srivaishnavas finally say “Oh! we are looking for udayavar’s mutt” and the person points them to the mutt. aruLALa perumAL emperumAnAr happens to be there at that time and becomes very upset that since he was living in a separate mutt with the same name as emperumAnAr while this conversation happened. Immediately he destroys his mutt, comes to emperumAnAr and tells him that he does not want to live in a separate place anymore explaining the conversation which happened. emperumAnAr accepts him, instructs him to live along with him in his own mutt and also explains all confidential principles to aruLALa perumAL emperumAnAr. Let us now understand his glorious literary contribution for our sath sampradhAyam. aruLALa perumAL emperumAnAr, out of his divine mercy, writes two prabhandhams in thamizh, gyAna sAram and pramEya sAram. These two prabhandhams bring out the most beautiful principles of our sampradhAyam, especially bringing out the glories AchAryan in a very beautiful way. piLLai lOkAchAryar‘s srIvachana bhUshaNam closely follows the principles that are explained by aruLALa perumAL emperumAnAr in these prabhandhams. mAmunigaL has done beautiful vyAkyAnams for these prabhandhams. Eventually, mAmunigaL (who is emperumAnAr himself) arrives and writes beautiful commentaries for the rahasya granthams as well as aruLALa perumAL emperumAnAr's gyAna and pramEya sAram prabandhams. A series of articles are written on gyAna sAram based on mAmunigaL's commentary in srI rAmAnuja dharsanam. Please view the same at http://www.varavaramuni.com/home/sriramanuja-dharsanam-magazine in multiple languages. Let us now enjoy the thaniyan of gyAna sAram. Simple translation: I was fully immersed in worldly pleasures (of women having beautiful blackish twirly hair and spear-like eyes) and was suffering in the endless cycle of samsAram. But my ignorance was destroyed and my miseries were dispelled after surrendering unto the beautifully glowing golden feet of aruLALa perumAL emperumAnAr who instilled the essence of four vEdhas through gyAna sAram firmly into my intelligence. He was totally dependent on emperumAnAr and had no other refuge and was constantly engaged in service to emperumAnAr's lotus feet. Out of his divine mercy, to uplift all jIvAthmAs by explaining these divine principles, he explains the essence of thathvam, hitham and purushArththam in dhrAvida bAshai (thamizh) to facilitate even the most ignorant person to understand these principles easily. Since this prabhandham discusses the essence (sAram) of gyAnam (thathvam, hitham, purushArththam), it was named as gyAna sAram. Thus ends mAmunigaL's beautiful introduction for this prabhandham. Let us have a quick understanding of thathva hitha purushArththam. piLLai lOkAchAryar have explained these principles in a crystal clear manner in thathva thrayam and artha panchakam. thathvam means truth. In spiritual matters, one must first understand the truth. Our pUrvAchAryas have often discussed the importance of understanding thathva thrayam (tattva trayam - the three truths). In fact, piLLai lOkAchAryar has compiled a beautiful rahasya grantham named thathva thrayam (http://ponnadi.blogspot.com/p/thathva-thrayam.html). In the first sUthram itself he says "mumukshuvAgiya chEthananukku mOksham uNdAm pOthu thathva thraya gyAnam uNdAga vENum" (முமுக்ஷுவாகிய சேதநனுக்கு மோக்ஷம் உண்டாம் போது தத்வ த்ரய ஜ்ஞானம் உண்டாக வேணும்) - For the one who is desiring for salvation from the cycle of birth and death, he shall have a clear understanding about the three truths viz chith (jIvAthmA - sentient beings), achith (insentient beings) and Isvara (bhagavAn - supreme lord) before being freed from samsAram.mAmunigaL's vyAkyAnam for this sUthram is most beautiful and must be heard from an AchAryan - he is called "visathavAk shikAmaNi" for his ability to present matters in the most beautiful and comprehensive manner. One should clearly understand the sarIra-sarIri bhAvam - that the bhagavAn is the super-soul of all chith (sentient beings) and achith (insentient beings). Because of this eternal relationship, chith and achith are fully sub-servient to bhagavAn and are present for the pleasure of bhagavAn only. prapathi - accepting bhagavAn himself as the means to achieve the ultimate goal after understanding that karma, gyAna, bhakthi yOgams are not fit for our svarUpam since they involve ones own efforts which highlights jIvAthmA's svAthanthriyam (independence). But since jIvAthmA's true nature is to be utterly dependent on bhagavAn, prapathi is the natural means to reach emperumAn. AchArya abhimAnam - Becoming the object of bhagavAn's grace through the grace of an AchAryan and simply being fully dependent on such great bhAgavatha's grace. AchArya is a true representative of srI mahAlakshmi in this world. Just like srI mahAlakshmi recommends to bhagavAn to accept the jIvAthmAs inspite of their defects, AchAryas also do the same. Out of their causeless mercy towards the suffering jIvAthmAs, they bless the jIvAthmAs and facilitate their upliftment by bhagavAn. Of all the upAyams, our pUrvAchAryas have shown that, AchArya abhimAnam is the best and easiest path for us to follow. purushArththam means that which is desired by a purusha (jIvAthmA in this context). Five types of goals are explained. kaivalya mOksham - self-realisation and enjoying ones own soul - this is generally identified as a cheap goal. Considering the glories of bhagavAn and the nature of jIvAthmA as a servitor to bhagavAn, if one desires to enjoy himself, it is compared to a person eating his own flesh while there is most delicious food available in front of him. bhagavath kainkarya mOksham - Serving bhagavAn eternally in paramapadham (the spiritual world). Having fully realized one's true nature that he is a servitor of bhagavAn, it is most apt for the jIvAthmA to engage in blemishless service in paramapadham which is the land of unlimited bliss. To summarize, a jIvAthmA should understand his true relationship with bhagavAn, accept bhagavAn only as upAyam through the mercy of an AchAryan and (aim to) serve bhagavAn eternally in paramapadham. Thus we have seen a little glimpse of aruLALa perumAL emperumAnAr's charithram (life) and vaibhavam (glories). He fully demonstrated total dependence towards emperumAnAr. We have also observed the important principles revealed in gyAna sAram. Let us bow down at his feet and pray that we too get such AchArya nishtai. 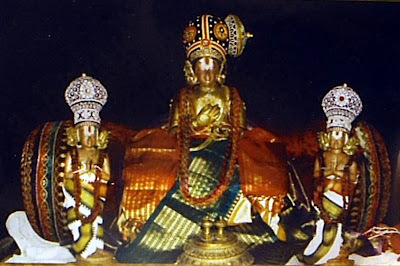 aruLALa perumAL emperumAnAr thirumEni (vigraham) is currently seen in vinjimUr (his avathAra sthalam), thiruppAdagam, srIvilliputhUr, etc. Let us also enjoy some pictures from this year's celebrations at thiruppAdagam dhivya dhEsam. Full set of pictures at https://plus.google.com/photos/107723698299182214927/albums/5947432025686636337.